Element placement within the area allocated by the parent takes place during the arrange stage. Placement depends on a variety of properties including Alignment, StretchHorizontally, StretchVeritically and the ratio of the size allocated by the parent to the DesiredSize of the child. 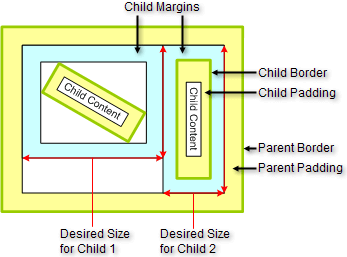 The layout scenario below shows two children with margins, borders, padding and an angle transformation for Child 1. In this case the parent has arranged the children with exact requested DesiredSize. 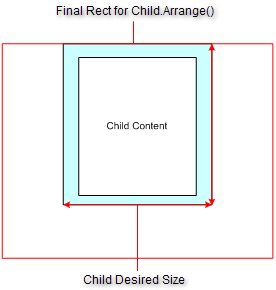 In the example below, the child DesiredSize is smaller than the rectangle allocated by the parent. The child StretchVertically and StretchHorizontally properties are set to false. The example figures show the effect of the child Alignment property setting on the resulting rectangle produced by the child Arrange() method. The area of the child that falls outside of the rectangle allocated by the parent is not clipped, but is shown to the extent it is within the area of the parent. See Clipping for more information. In the example below, the child DesiredSize is larger than the rectangle allocated by the parent.